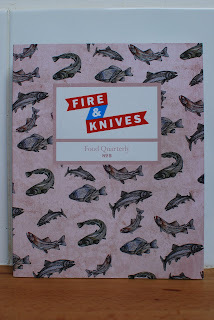 I'm in Fire & Knives! Just a quick piece of self-publicising-trumpet-that-I-own-blowing, to inform you, the beautiful, intelligent readers of my blog (and any other interested casual passers-by), that I have just had a piece published in the latest edition of the truly excellent and respected independent quarterly food writing magazine ‘Fire & Knives’ issue no.8. To say I’m absolutely chuffed is an understatement. It looks amazing, and to see my name in print and in such a quality publication as well, is an incredible feeling. 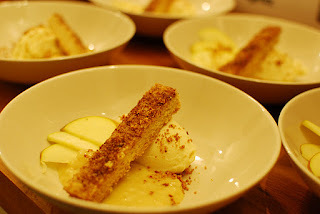 I’ve written about the trials and tribulations of hosting a supper club. 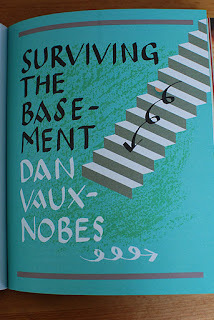 Our Bristol based ‘Montpelier Basement’ providing ample inspiration and ammunition. (Shazza, I’m looking at you). If you fancy getting yourself a copy; and I highly recommend you do, if for no other reason than to experience the glorious heady smell of it’s printed pages (I’m not kidding, the aroma is something else, like glue sniffing for respectable adults) Then you can pick up a copy at good independent bookshops, or you can grab a subscription online here. That’s the sound of your guests, in unison, involuntarily projectile vomiting your beautiful Sunday lamb roast out onto your face, the walls, the table and each other in utter disgust. You look around the table, confused. They’re angry, there’s swearing and pointing, people are getting up and leaving. Your best friend gestures at you angrily as if shaking a handful of coffee beans. You don’t think he wants coffee. And then slowly, it dawns on you. The awful cheap arse ready-made supermarket mint sauce accompanying your lamb. What a complete and utter fool you’ve been. It all could have been so different if you’d made it yourself. Cheer up. I'm going to tell you how to ensure that this sorry, entirely realistic scene never happens to you. But first, a bit of back-story. In March this year, I ate at The Sportsman in Seasalter, Kent. Accompanying my lamb cutlet was the best mint sauce I’ve ever tasted. So amazing was it that both ‘E’ and myself sat there, awestruck for a full 5 minutes. Tasting, analyzing and debating just why the hell it tasted so good. We’ve subsequently served lamb at our ‘Basement’ supper club a few times, and tried to recreate The Sportsman’s mint sauce each time. We think we’ve almost cracked it. This simple recipe comes in two parts. 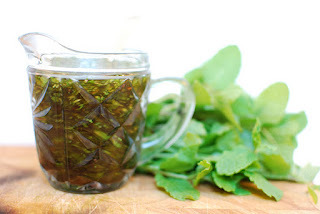 A base mint sauce, and then a basic stock syrup made using Demerara sugar to sweeten it. Equal quantities of Demerara sugar and water, 200ml of each should do it. More fresh mint, finely chopped. For the base mint sauce, there’s no need to pick or chop the mint, put it in a saucepan and pour over the vinegar. Add the sugar and bring to the boil, cook for a few minutes until the sugar has dissolved. Leave to cool. The mint sprig can be left in. This can be kept in a sealed jar, in the fridge pretty much indefinitely. Make the stock syrup by bringing the sugar and water to the boil for around 2 minutes, until the sugar has dissolved and it becomes syrupy. You can use this straight away or keep in the fridge for up to 2-3 weeks. To serve, strain a small pot or jug full of the base mint sauce into a small serving jug. Add a good handful of finely chopped mint and stir well. Add a generous amount of stock syrup, stir and taste. Too sharp? Add more and keep on adding small amounts until it’s exactly how you want it. The Demerara stock syrup adds a caramel note that really makes this mint sauce taste superb. Finally, serve with your lamb and receive the adulation you so richly deserve. This is a dessert we’ve served up at our Bristol based ‘Montpelier Basement’ supper club a few times recently, including our London debut at The Coach & Horses. It seemed to go down incredibly well, so I thought I’d write the recipe up on the blog . In actual fact it's three recipes combined, stolen from three different chefs; Gordon Ramsay, Tom Kitchin and Jason Atherton. Between them they hold a multitude of Michelin stars but it took our culinary genius to slap the three elements all together in one bowl. So a massive 'in your face' Michelin starred chefs! Ok first up, the ewe’s curd cheesecake mousse. This is an awesome recipe from Tom Kitchin. He uses Crowdie, which is a Scottish cream cheese. We used Homewood ewe’s curd instead, which is produced locally in Somerset by Tim & Angela Homewood, and is absolutely fantastic. Preheat the oven to 150C. Mix the cheese, sugar, flour, vanilla and lemon zest in a blender until smooth. In a separate jug, mix the egg and egg yolk together, then pour into the blender with the cheese mixture and blend until smooth. Pour into a 23cm baking dish and cover with foil. Bake for 35-40 minutes until set. (We cooked a much bigger volume, so it took quite a bit longer to set). Allow to cool and then transfer the mixture to a blender, and blitz until smooth. Leave to set in the fridge for at least 1 hour. The butterscotch apple sauce is a Gordon Ramsay recipe, in fact, a component part of another dessert. It’s incredibly sweet but tastes amazing partnered with the slightly sour cheesecake mousse. 1 Large Granny Smith Apple, peeled cored and chopped. Put the chopped apple in a small pan and sprinkle over 2 Tbs of water. Slit the vanilla pod and scrape out the seeds, adding them to the pan with 2 Tbs of caster sugar. Stir into the apple and heat until sizzling. Then cover and cook for 5-7 minutes, stirring occasionally, until soft and pulpy. Cool then crush to a chunky puree with a fork. In another saucepan, gently heat the 100g of sugar with a splash of water until melted. Stir occasionally. When clear, raise the heat, stir in the butter and cook to a light caramel. Do not stir at this point or it will become fudge. Remove from the heat, and cool for 5 minutes before mixing in the cream. Cool to room temperature, before stirring in the apple puree. Refrigerate. The third component is a Jason Atherton recipe for Spiced Shortbread. We’ve found it works really well, is incredibly simple to make and the spices give it a bit more of an interesting flavour. 225g Unsalted Butter, cubed and softened. Plus extra to grease tin. Preheat the oven to 150C. Grease a 23cm square baking tin with butter and line it with buttered greaseproof paper, allowing plenty of overhang on opposite sides to act as handles. Sift the flours, salt, star anise and cinnamon together into a large bowl; set aside. Using a mixer, beat the butter until soft and fluffy. Tip in the sugar and beat for 2 minutes on high speed until creamy. (You can do all this by hand, but it’s hard work!) Add the creamed mixture to the flour and knead together by hand until uniform in texture. Press evenly into the prepared tin and bake for 1 hour until golden. Leave to cool in the tin for 5 minutes. For the topping, mix together the cinnamon and the 1 tbsp of sugar in a small bowl. Carefully lift the shortbread out of the tin (it's extremely fragile at this stage), using the overhanging paper as handles and place on a board. Cut it in half, and then into 1.5cm fingers. Sprinkle with the cinnamon-sugar mix (We also added a bit of leftover ground star anise to this). Place on a baking sheet, spaced apart and bake for another 10 mins to dry out. Transfer to a wire rack to cool and store in an airtight container. We sprinkled the final dish with cobnut crumbs. Basically roasted cobnuts which if you don’t know are like hazelnuts and smell absolutely incredible. Discard the outer husks, use a nutcracker to remove the shell and bake the nuts in a 150C oven for up to an hour, until hard and browned. Cool and then blitz to a crumb texture. All that’s left to serve is a bit of assembly. If you’re dexterous and suave, shape the cheesecake mousse into a quenelle and place delicately on the plate. Or if you’re me, dollop some on like a bricklayer shovelling cement. Next to this, add a generous portion of the butterscotch apple sauce. In an extremely cheffy asymmetric style, smugly place your spiced shortbread across the other two components. If you have a moustache, as this stage, you must twiddle it, if not, arch one eyebrow. Slice some apple and fan it out in a pleasingly pretentious fashion. 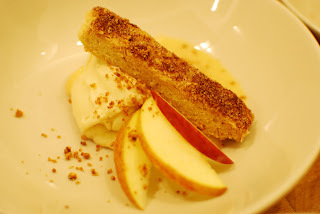 Finally, sprinkle some cobnut crumb over everything. Bon appétit. Your work here is done. A few weeks ago, at the Abergavenny food festival, I was in the audience for a talk on the subject of hangover cures held by chefs Fergus Henderson, Shaun Hill and journalist, Chris Hurst. The cures suggested onstage weren’t a million miles away from my own hard won antidotes, gleaned from many wasted years of trial, much error and scant few conclusions. But then I was gobsmacked, some might say literally. Introduced to something entirely new in my experience, something revelatory. A potential silver bullet for all future suffering caused by a surfeit of alcohol, the cure-all that is a Dr Henderson. 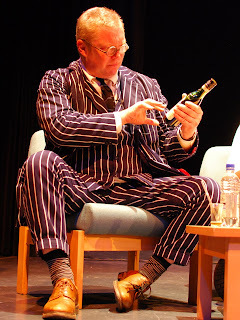 As I entered the theatre, I was handed a small glass of murky, brackish, green and brown liquid, seemingly the contents of a flu sufferer’s hanky, scraped into a glass over ice. The straw protruding from it, obviously functioning as a stake through its foul heart. This revolting looking cocktail, (an unholy combination of the Italian herbal monstrosity Fernet Branca and Crème de menthe), was being touted by Fergus Henderson as the answer to any and all hangovers. Against my better judgement, I bravely took an exploratory sip. Instantly, I was seven again, at the dinner table being force-fed boiled to death cabbage or sprouts, eyes closed and face contorted into a deathly grimace, lips curled back in the absolute epitome of disgust. But then, a funny thing happened. The shock dissipated, faded away and left behind it a curious green, brown, minted haze tinged with a bizarre almost electrical current of mental alertness. On stage, Fergus likened the feeling to a rebounding ‘ping, ping, ping’ down his chest. Astounded, I took another sip, and another, amazed to find that I actually liked it and wanted more. The ultimate test of course would be the stupidity/bravery of self-prescribing a Dr Henderson whilst in the throes of a raging hangover. Against my better judgement, I’m seriously tempted and shall report back when I do. If you fancy trying this wonder cure yourself, the ratio for a Dr Henderson is two parts Fernet Branca, to one part Crème de menthe, mixed together with ice. In the meantime, my own tried and tested hangover cure is thus. If you’re sensible, as soon as you come staggering in, no doubt stinking of kebabs and Sambuca, head to the kitchen and neck a whole pint of water before bed. This one simple action could save you from enduring the whole hangover experience entirely. Obviously a glutton for punishment, I always forget to do this and wake up feeling like death, in which case I follow the next step. The pint of water you forgot to drink before slumping into bed, combined with 2 Paracetamol is the foundation of the cure. If you’re going to be sick, obviously get this out of the way before, or all your efforts will be wasted. Next you want to lie very still, in a darkened room, softly moaning in agonised self pity. Do this for around an hour until the pills kick in and it all becomes a bit more bearable. Then you can crawl into the bathroom to brush your teeth and have a hot shower. After this, you’ll emerge feeling a hell of a lot better. But you’re not there yet. You need a steaming mug of tea, and a fried bacon and egg sandwich. The greasier the sandwich, the better it works in soaking up alcohol. I have no idea of the science behind this, best not to question it, just accept its absolute rightness with blind faith. Follow the prescribed steps, and you will feel fantastic and ready, once again to face life and all it’s challenges. But I should point out, this only works for the standard everyday hangover. Sometimes, and we all do it, we go a little bit bonkers. We push it just that little bit too much, stupidly convinced of our own particular invulnerability to the devil drink. The resulting hangover is nothing short of epic. In cases like this, try and drink the water, and keep down the painkillers. Forget about the shower and brushing your teeth (making it to the bathroom for anything other than copious bouts of vomiting will be beyond you). Bacon and egg sandwiches? Forget it, just the thought will plunge you into a spinning hell of misery and nausea. Basically, if you were a racehorse, they’d be dragging you out back and putting you out of your misery with a Webley. You’ll just have to lie there, endure and wait for it to wear off. Obviously, a hangover is a very personal thing. I’d love to hear how you deal with it. What do you recommend as the best cure for a hangover? Am I wrong; is there in fact a remedy for an epic ‘pray for death’ hangover? Have you ever tried a Dr Henderson the morning after? And did it actually help?